A 75-metre cantilever is the defining feature of the CCTV headquarters designed by OMA with lead architect Rem Koolhaas wanting a skyscraper that beats the conventional tall square buildings competing for height in the city of Beijing. Rem Koolhaas and his architecture firm, OMA, must have wanted to send a statement in their first major project in China and their largest project ever. The statement was clear; that the quest for more space doesn’t have to end in the battle for ultimate height. The CCTV headquarters is both a visual and functional manifestation of that. 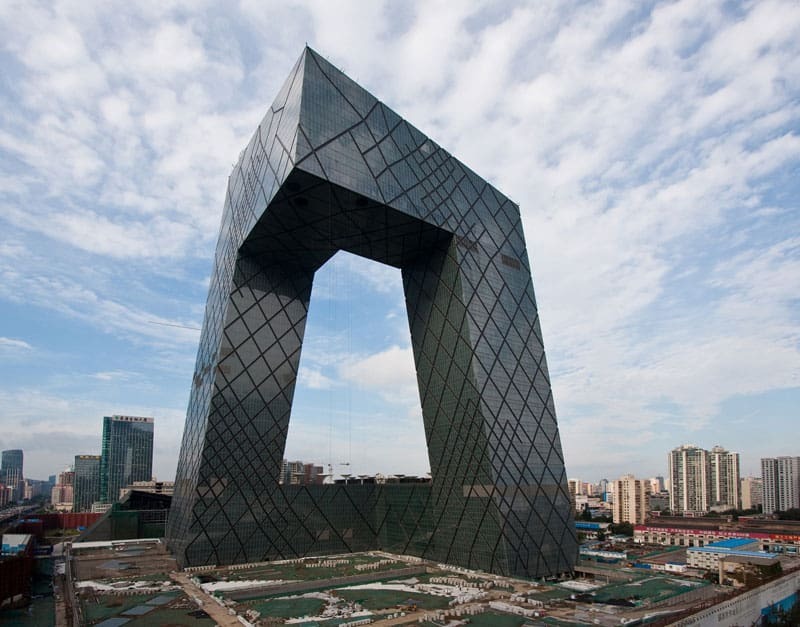 Rem Koolhaas together with his partners and team of 100 architects who work for OMA, designed this landmark building in the city of Beijing, whose construction started in 2004 and ended in 2012. This skyscraper is a testament of great thinking that defies the status quo by finding another way of building a tall structure, without necessarily going as high as you can go. The CCTV headquarters squashed the exhausted typology of the Skyscraper. It is very difficult to find skyscrapers that stand with daring boldness as this one. It can be seen all around Beijing, yet sometimes from a different side it looks really big and sometimes looks small when approaching it from a different side. Some angles of this work look really strong, yet some look really soft. All that because the building was designed to accommodate three different programs in three connected structures. Two towers rise from a common studio production platform known as the Plinth. The first tower which is the tall one serves as the editing area as well as housing offices. The lower Tower 2 boards the news broadcasting space. These two towers are joined by the 75-metre cantilever which accommodates the administration spaces in an area now known as the Overhang. Arup worked together with the architects to come up with a structural system that was sufficient to support the tower which seems to defy the laws of gravity. Both towers lean towards each other meeting the Overhang at right angles. The structural system gives the building it’s façade, with the areas of greater stress having a more dense web of triangulated steel tubes, while the areas that require less support showing loose and less dense diagrids. To sun shade the building, a self-supporting hybrid façade structure was adopted. It features high performance glass panels with a sun-shading of up-to 70 percent open ceramic frit. This high-tech glass gives the CCTV headquarters its silver-grey colour that in turn subtly positions this building in the Beijing Skyline. A 10,000 square metre main lobby in Tower 1 contains an atrium that stretches over a span of 3 basement floors and 3 floors above the ground. The basement levels create a direct connection to Beijing’s subway network, therefore acting as the welcoming area for CCTV’s 10,000 workers most of whom use the trains. Directly connected to the lobby are 12 studios used for TV productions. The cantilevered floors provide workers with spectacular views to the CBD, the Forbidden City and the rest of Beijing.